It’s no joke: on April 1, ESPN will officially take the wraps off ESPN South Street Seaport Studios in Manhattan, a new facility that will add two studios with a combined 6,100 sq. ft. to ESPN’s arsenal. It will be the new home of NBA Countdown as of April 1, and then, the next morning, a new program, Get Up! will begin airing weekdays at 7-10 a.m. ET. Calcinari and Michael Foss, supervising director, remote operations, spent about five months scouting locations before settling on the Seaport. Located at the base of Manhattan, it is one of the few spots that afford views of such landmarks as the Brooklyn Bridge, the Statue of Liberty, the Freedom Tower, and even the Empire State Building and City Hall. 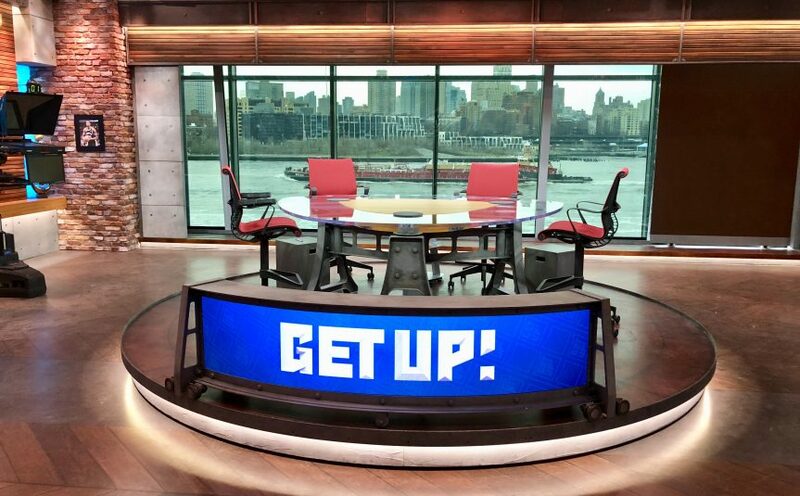 ESPN’s new set for Get Up! provides a dramatic backdrop of the East River and Brooklyn Bridge. The East River itself provides a backdrop of near-constant activity with ferries and barges, and robotic cameras positioned on the roof can also grab shots of the harbor. The great backdrop is only one benefit of the location. The team will have a much easier time booking athletes and celebrities to appear on an ESPN show, because they won’t need to travel to Bristol, CT. Located at the foot of the Brooklyn Bridge, the larger studio measures 3,900 sq. ft. and will be the home of Get Up!, NBA Countdown, and a new show featuring Bomani Jones and Pablo Torre that will begin airing later this year. A window behind the main set looks out to the Brooklyn Bridge and the East River, and, in the event of glare, a custom-built track system with five stacked LED boards can create a 30- x 8-ft. LED wall in front of the window. “We have a lot of places to do TV in the studio,” Calcinari points out. There is the main set, an LED wall for standups, a touchscreen for a different look to standups, a bullpen area, and another set with more of a living-room feel. “We want to be able to use the whole space,” adds Calcinari. Alteros RF mics and beltpacks will help in that process, and a massive lighting infrastructure can make every corner usable as a shooting location. The smaller studio measures 2,300 sq. ft. and is expected to be completed in August, with programming details to be announced later. The two main studios will be complemented by a smaller radio/podcast studio (outfitted with a Simplylive Vibox touchscreen production system) and an insert studio in the newsroom that can be fired up at the push of a button. 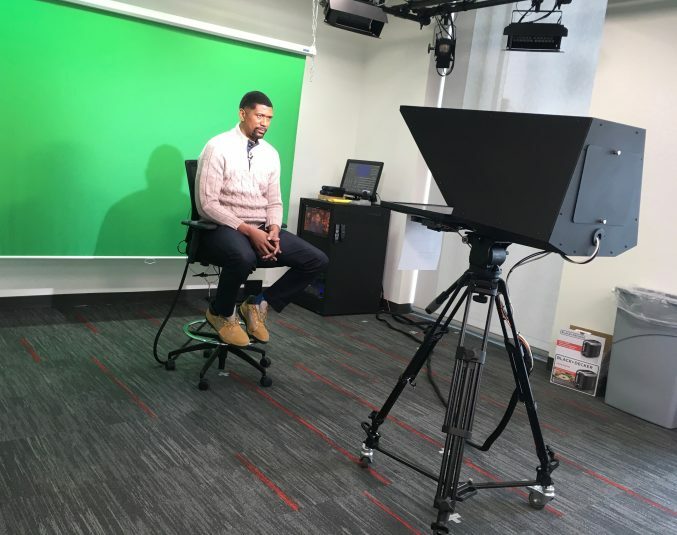 ESPN’s Jalen Rose tests out the new Bureaucam at ESPN’s Seaport studio in Manhattan. One major feature of the facility is what is not there: studio-control rooms. ESPN continues to embrace the REMI model, and the Seaport studios will make use of two 40-Gbps diverse transmission paths from AT&T (with RCN providing last-mile fiber support) to allow personnel in control rooms in Bristol, Washington, and Los Angeles to ultimately cut the shows. NBA Countdown will still be produced out of Los Angeles, and Get Up! will be produced out of Bristol. The new show with Jones and Torre will be cut out of Washington. The producers, camera operators, an A2, engineering, and video shaders will be located in New York, along with talent bookers, researchers, and writers. The technical director, A1, and core integration team will be located remotely. Even without control rooms, there is still plenty of technology onsite. The facility is operating in 1080p, a first for studio operations at ESPN. An Evertz EQX router (112×176 with 48×48 embedding/de‐embedding and expandable to 256×256), a Wheatstone radio-control-room system with an LX-24 digital audio-control surface, a Lawo Power Core 128×128 audio-processing unit, an RTS Adam Matrix 320×320 intercom, and a DNF tally system are all in use. The camera complement includes 10 Sony HDC-2500 cameras, five Panasonic AW-HE130 cameras, two Panasonic AW-HR140 robotic cameras on the roof capturing scenics, and an Azzuro Bureau camera in the newsroom. Seven of those cameras are located in the main studio. There are also onsite editing capabilities via a Q edit system that ties into the Quantel system in Bristol and also onsite Adobe Premier editing capabilities. Signiant is in use to allow files to be exchanged between the Seaport and other locations across the country. Another feature of the Seaport is a 100,000-sq.-ft. roof deck that will feature concerts in the warmer months and things like a Winter Village and a skating rink in the colder months. Open 24/7 with the exception of private events, the deck will give ESPN additional flexibility in shooting locations and segment concepts. “It’s a really cool outdoor space where we can do the man-on-the-street kind of interviews or even do a show from there,” explains Calcinari. And ESPN and its sponsors and advertisers can also take advantage of the space. One of two Crash Carts that ESPN will rely on to shoot from various locations at its Seaport Studios in Manhattan. ESPN will use two Crash Carts, portable units that can be wheeled around the Seaport and plugged into one of the main BSP (Broadcast Service Panels) located on the roof, pier, and around the Fulton Street Market to provide power and fiber connectivity. The custom-designed Crash Carts are motorized and can support audio, video, communications, and internet at outdoor locations around the Seaport. BSI Blue Steel wireless microphones operating in the 1,435-1,525 MHz spectrum will be used to avoid any issues with RF reception in the congested RF environment of lower Manhattan. 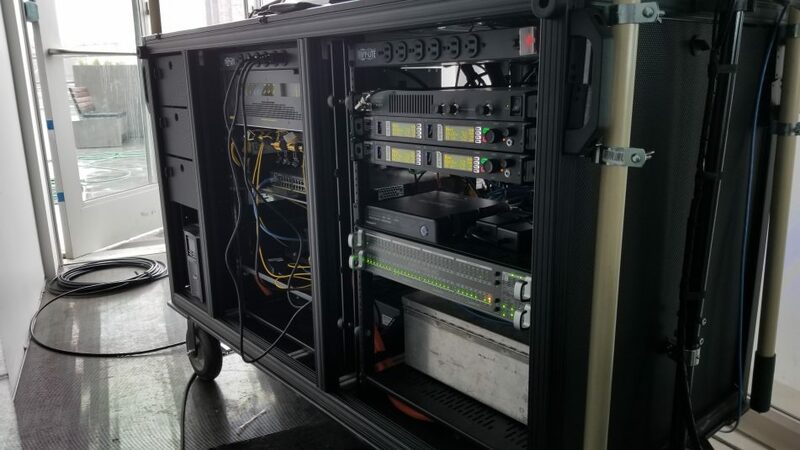 “The Crash Carts support three cameras, although they can support four, as well as up to eight microphones and IFB wireless comms,” says Strong. Clear Com’s Freespeak wireless intercoms are also used to provide a single system for needs both inside and outside the Seaport Studios. 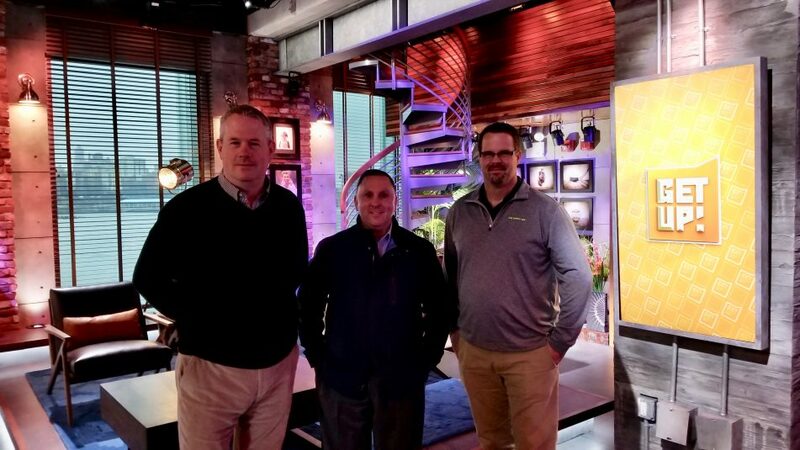 It has been an accelerated ride for all involved: ESPN’s team; NEP, which provided much of the technical infrastructure; set designer James Yates Production Design; and Mystic Scenic.